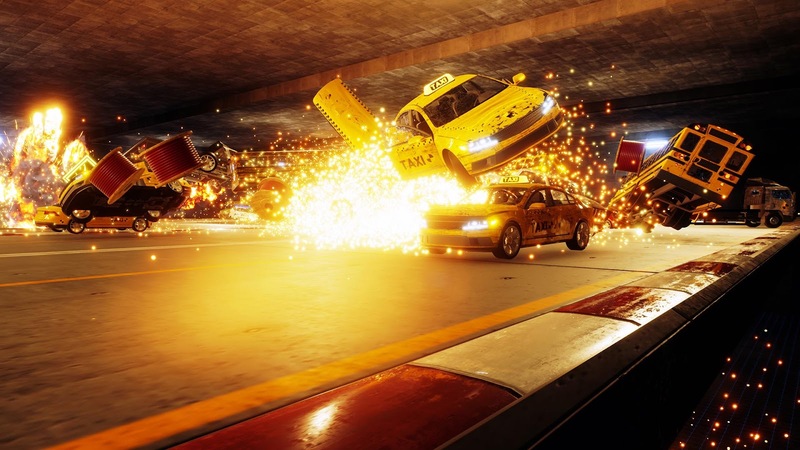 Developer Three Fields Entertainment’s ultimate goal when it split away from Criterion was to try to recapture the explosive thrills of their former studio’s glorious crash-filled Burnout racing series. After getting their feet wet with a couple of other projects, including Dangerous Golf whichwe also reviewed, the time for shredded metal and fiery car crashes has finally arrived in the form of Danger Zone. 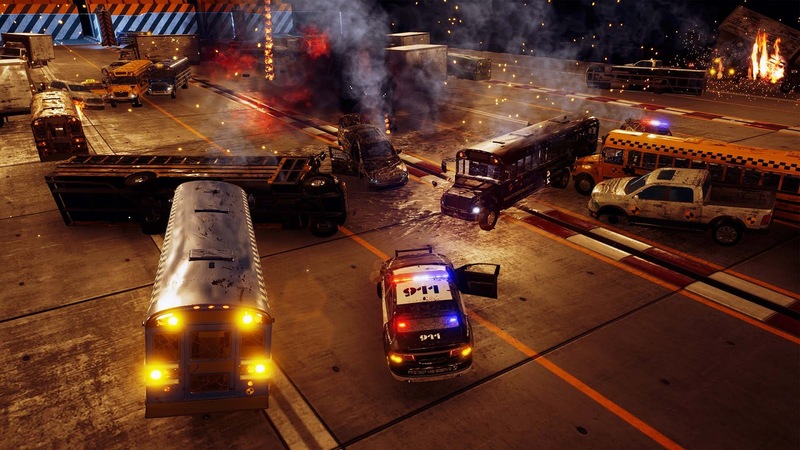 How did this fresh take on Burnout’s famous crash junctions turn out? Find out in our full PS4 Danger Zone review. The idea behind Danger Zone is exactly like the crash mode in Burnout where your objective is to barrel through intersections full of crisscrossing traffic to try and cause the biggest, most spectacular, most explosive wrecks you can. These are not the city streets and “real” intersections we enjoyed in the Burnout series, however, as Danger Zone’s brand of vehicular mayhem takes place entirely inside some sort of testing facility. Every level takes place in the same big, dark, industrial test room. The twenty levels are all varied and different, despite taking place in the same environment. Each level has different configurations of roadways and jumps and traffic to interact with along with strategically placed cash bonuses and Smashbreaker powerups scattered around. Smashbreakers are key to Danger Zone because they allow you to trigger a huge explosion that not only sets off a chain reaction in the A.I. cars around you, but also lets you move your car around in order to collect more powerups and hit even more cars. The idea is that each level isn’t simply a sandbox to create carnage in but actually a carefully laid out puzzle that you have to find the proper solution to. You have to not only hit the right cars at the right speed to pinball them into other vehicles, but also collect bonuses and Smashbreakers in a specific order, and activate them in the right locations, in order to maximize the damage you’re causing to earn the highest score. It is a satisfying take on physics-based puzzle games that can be a lot of fun. While Danger Zone is a totally competent experience mechanically, the real question is whether its brand of crash mode is as good as the real deal from past Burnout games. The answer, unfortunately, is no. Crash mode worked in Burnout because it was present alongside spectacular racing modes. Stripping everything out except for the crashes makes Danger Zone feel really shallow and, similar to Dangerous Golf, once the thrill of seeing explosions wears off (and it does faster than you’d think) the experience is just kind of boring. Likewise, the fact that every level takes place in the same bland, dark, sterile test stage rather than in the real world kind of kills the mood even further. Danger Zone also doesn’t have nearly the sense of speed and violence that the crashes in Burnout have which, again, makes the game feel far too calculated and sterile rather than visceral and exciting. Danger Zone isn’t a bad game at all. Like I said, it is actually really solid mechanically and the gameplay itself is totally fine. But it also feels strangely shallow and bland. After the first few levels I just wanted to load up Burnout 3 or Burnout Revenge rather than continue playing Danger Zone to remind myself why I ever wanted something like this in the first place. A small team on a tight budget created Danger Zone and that fact is particularly obvious when looking at the presentation. The vehicles all actually do look pretty decent and have some nice details, but the dark test chamber environment is just ugly. Also, while the explosions and special effects with sparks flying everywhere look awesome, there is very, very little damage done to the vehicles themselves. No parts flying off (though, items trucks are carrying do fly around with their own physics). No crumpled metal. Just scratched paint and maybe the wheels fall off. The sound is only okay with the crash sound effects you’d expect but there’s no music. At all. Anywhere. Just silence. Rounding out the lackluster presentation are some of the most boring and straightforward menus on PS4. Ultimately, while Danger Zone perfectly re-creates the core mechanics of Burnout’s famous crash mode, the charm and soul (and budget) are sorely missing here and the result is surprisingly flaccid despite being a game about creating huge car crashes. It is mechanically totally fine and well executed, but the thrill just isn’t there. Three Fields smartly priced it more appropriately than it did with Dangerous Golf, thankfully, so even if it isn’t exactly the game Burnout crash fans might have wanted the $13 asking price makes it worth a look anyway. 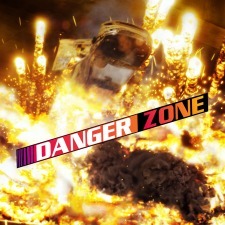 Give Danger Zone a look if you’re in the mood for pretty explosions and want to kill some time.